Flyers off the front. Monster pulls. All-out sprints to the line. Venge riders absolutely live for this stuff—that’s why they demand complete performance: the winning formula of weight, stiffness, and aerodynamics. 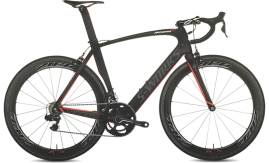 The Venge’s Tarmac-inspired handling and Shiv-inspired stiffness and aerodynamics are a competition-crushing combination.